Vincent: "And you know what they call a Quarter Pounder with cheese in Paris? Vincent: "No man, they got the metric system. They wouldn't know what the [heck] a Quarter Pounder is." Jules: "Then what do they call it?" While the cinephiles in the room will be quick to point out that I'm quoting from Quentin Tarantino's Pulp Fiction, I'm also highlighting an example of a business (McDonald's) tailoring their marketing to better serve a particular audience. And, as you're about to find out, this type of international name personalization is more common than you might think. 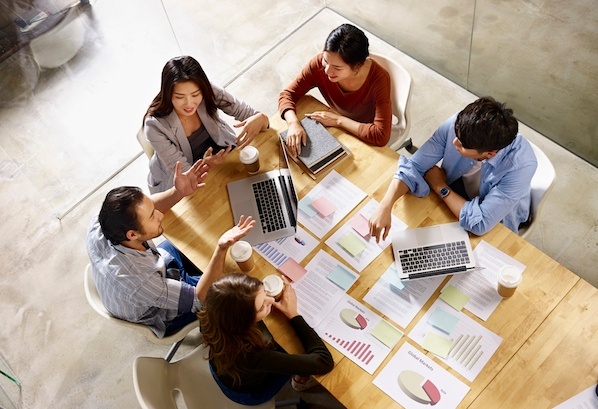 Several of the big brand names that have been injected into American culture through countless ads and jingles -- names that are as common to you as the names of your friends and family members -- are, in fact, different in different countries. But before we dive into some examples of businesses switching brand names in order to cater to international audiences, let's explore some of the underlying reasons why these name changes occur. And to begin, here’s a quick story about Irish whiskey liqueur, cow dung, and German consumers. Once upon a time, the Dublin-based beverage distributor C&C Group decided to launch its popular brand of golden whiskey liqueur in Germany. It seemed like a good plan. 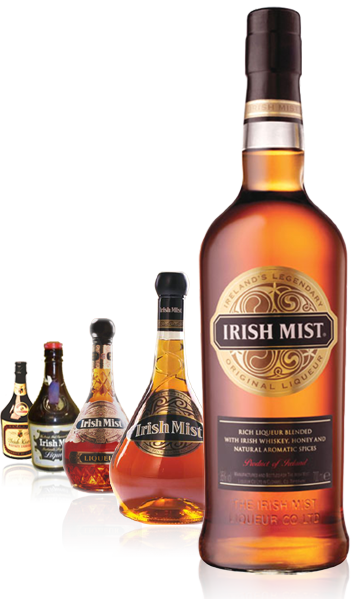 After all, Germany was a big market, and the name of the whiskey liqueur, "Irish Mist," certainly had a nice ring to it. To me, the name “Irish Mist” conjures up an image of a verdant field adorned with a fresh layer of morning dew; dew that is evaporating majestically into the glorious light beams of the rising sun. Unfortunately, that’s not what Germans thought of when they heard the name. You see, “mist” is the German word for “manure.” So while Germans may in fact have thought of a field when they heard the name “Irish Mist,” they probably didn’t think of a field adorned with dew: They probably thought of a field adorned with cow dung. Needless to say, a beverage that translated to “Irish manure” didn’t exactly take off in Germany the way C&C Group had hoped. Different cultures have different values. Different languages. Different slang. Different senses of humor. A name that sounds elegant in one language could sound off-putting or downright gross in another language. Even when it’s unintentional, a name that doesn’t play well in a certain country could mean the difference between a boom in sales and a boycott. 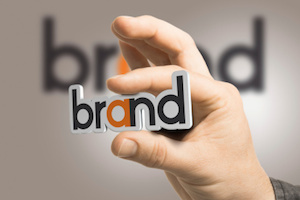 Ultimately, taking a one-size-fits-all approach to brand names is trickier than most people think. Even making up a completely new word for a name isn’t a sure bet. “‘Monde’” derives from the Latin word for ‘world’,” the press release notes, “and ‘delez’ is a fanciful expression of ‘delicious.’” No problems yet. But how exactly do we pronounce “Mondelez”? According to the same press release, it’s pronounced “mohn-dah-LEEZ.” And that poses a bit of a problem for Russian speakers. Turns out that in Russian, “Mondelez” sounds like a vulgar word; a word that a native Russian speaker described as “really dirty” in the Huffington Post. Not a great fit for a snack company … or any company, really. One brand that definitely did it right is Kodak. 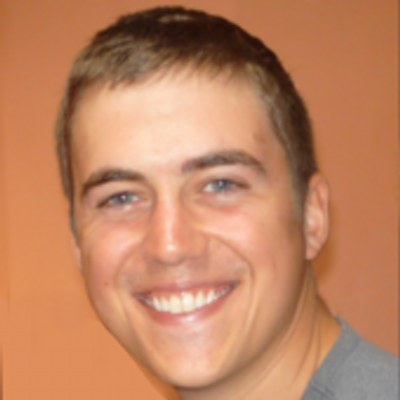 When they came up with the name “Kodak” -- a name that is totally meaningless -- they made sure A) that it was easy to pronounce in every country where they’d be selling their products, and B) that it had no negative connotations in any of the languages spoken in those target countries. That type of linguistic research helped ensure that Kodak didn't make the same mistakes that Irish Mist and Mondelez would eventually make. Of course, the alternative to coming up with a perfect brand name, a brand name that can effortlessly travel from country to country without offending anybody, is (as I mentioned earlier) to change names in order to cater to different international audiences. So, without further ado, here are some examples of big brand name changes from around the globe. 1) Mr. Clean / Maestro Limpio / Meister Proper / etc. This is, by far, the best example I could find of a brand tailoring its name to different countries. 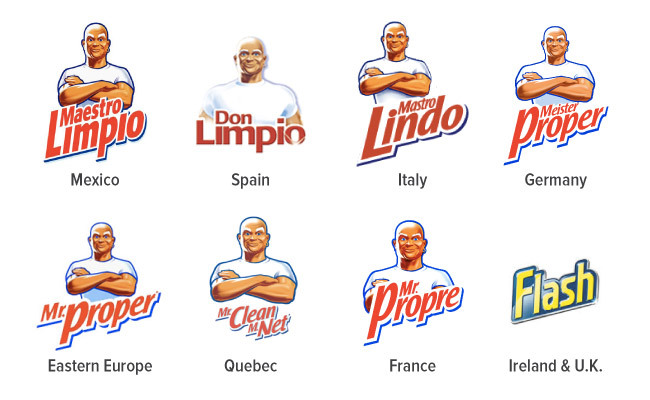 While we all know and love "Mr. Clean," here in the U.S., he goes by many, many other names while traveling abroad (all of which loosely translate back to "Mr. Clean" in English). For example, there's "Maestro Limpio" in Mexico, "Don Limpio" in Spain, "Mastro Lindo" in Italy, "Meister Proper" in Germany, "Mister Proper" in Eastern European countries, "Monsieur Net" in Quebec, Canada, "Monsieur Propre" in France, and "Flash" in Ireland and the U.K. Wait a sec, what was that last one? So it turns out the name "Mr. Clean" was already taken when P&G expanded into Ireland and the U.K. As a way around the problem, they ditched the buff bald guy and came up with an entirely new brand name: "Flash." 2) Lay's / Walkers / Smith's / Sabritas / etc. Another well-known brand with many different international names is Lay's (of potato chip fame). For example, in Ireland and the U.K., Lay's are called "Walkers." In Australia, they're called "Smith's." In Mexico, they're "Sabritas." In Egypt, "Chipsy." In Israel, "Tapuchips." And in Brazil, they're "Elma Chips." Unlike with Mr. Clean, the owner of Lay's (PepsiCo, by way of its subsidiary Frito-Lay) makes no real attempt to translate when tailoring the name to international audiences. But considering "Lay's" is derived from a guy's name, Herman Lay, that makes a lot of sense. PepsiCo does, however, create some unity between the brands by making the logos visually similar: they all include a red, wavy banner, which is reminiscent of the banner in the Lay's logo. You see, when Burger King was expanding into Australia, they ran into a little problem: There was already a fast food joint that had trademarked the name "Burger King." So, Burger King -- the U.S.-based Burger King -- allowed the Australian franchisee (a man by the name of Jack Cowin) to choose from a list of pre-existing trademarked names that its then parent company (Pillsbury) had on hand. Jack chose the name of a pancake mix brand, Hungry Jack, and added an apostrophe to the end to make it possessive. And then a new Australia-specific Burger King brand name was born: Hungry Jack's. Truth be told, the previous Burger King / Hungry Jack's example didn't really demonstrate a business changing a brand name in order to appeal to a particular audience. They changed it because, well, they had to. BUT it was such a big brand, I felt obligated to include it. And for that same reason, I feel obligated to include this next international name-change example. KFC. This three-letter appellation for the "finger-lickin' good" fast food chain, was originally an initialism for Kentucky Fried Chicken. Today, KFC does big business all over the world, including in China, Japan, India, Indonesia, and Malaysia. Yet in all of these places, KFC is still KFC. So, where do you need to travel in order to find a KFC without the familiar "KFC" branding? Try Montreal. Quick story: I lived in Montreal, Quebec for six years. And when I first moved there, I noticed something very unusual about the KFC joints I encountered: They were all branded "PFK." The reason? Quebec has very, very strict language laws, which means if you're a business with an English name, you're required to create a French equivalent. So, the powers that be translated "Kentucky Fried Chicken" into French, which came out as "Poulet Frit Kentucky," and voila: PFK was born. The skincare brand Olay got its start in South Africa, but was purchased by P&G in the 1980s. When P&G decided to roll out the brand internationally, it made an effort to tailor the name to suit different cultures and languages. 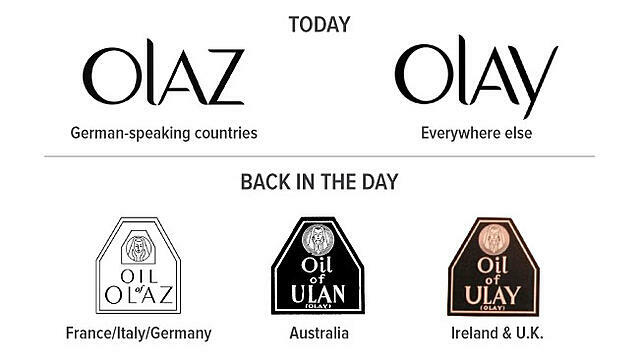 For example, in France, Italy, Germany, and other mainland European countries, Olay went by the name "Oil of Olaz." In Australia, it was called "Oil of Ulan." And in Ireland and the U.K., it was "Oil of Ulay." Unfortunately for fans of geo-specific brand names, P&G would eventually streamline the brand and eliminate many of the name variations. Today, there's just "Olaz" (in German-speaking countries) and "Olay" (everywhere else). Now this is a cool story. But here's a forewarning: I'm not exactly sure why the Mars confectionery corporation names its candy brands the way it does ... it just doesn't seem to make any sense. So on that note, let's dive in! In 1923, a man by the name of Fank C. Mars introduced the "Milky Way" bar. MmmMmm. Milky Way bars. Milk chocolate. Caramel. Chocolate-malt nougat (whatever the heck that is). Delicious. So, to recap: U.S. "Milky Way" = U.K. "Mars bar"
After successfully establishing the Mars bar in Europe, Forrest Mars moved back to the U.S. and would eventually merge his company with his father's company, forming Mars, Inc. And, in an effort to increase international expansion, Mars, Inc. decided to introduce the "Milky Way" brand in the U.K. and other European markets. However, since the original Milky Way was, effectively, already available in the form of the "Mars bar," Mars, Inc. needed to tweak the recipe. So, they followed their old playbook and used an existing recipe from their inventory: the recipe for their 3 Musketeers bar (which they had introduced in the U.S. back in 1932). Hence, today, Milky Ways in the U.K. taste a lot like 3 Musketeers in the U.S. 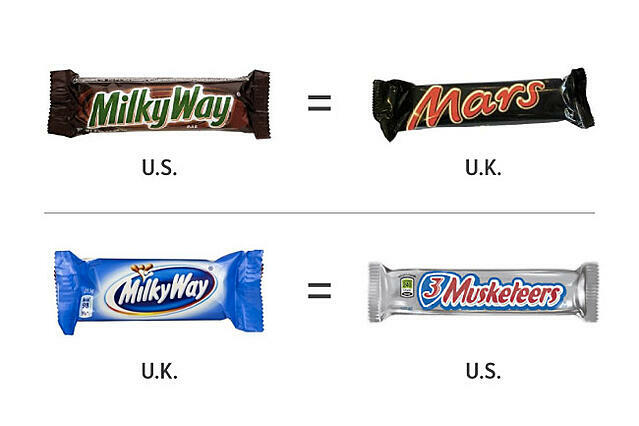 So here's the final breakdown: the U.S. "Milky Way" = the U.K. "Mars bar," while the U.K. "Milky Way" = the U.S. "3 Musketeers." And yes, these candy bars are all produced by the same company, Mars, Inc.
And that concludes our exploration of personalizing brand names for different locations. Now, admittedly, I didn't really teach you anything about using personalization for your own marketing purposes. This was just a collection of fun, inspirational examples. 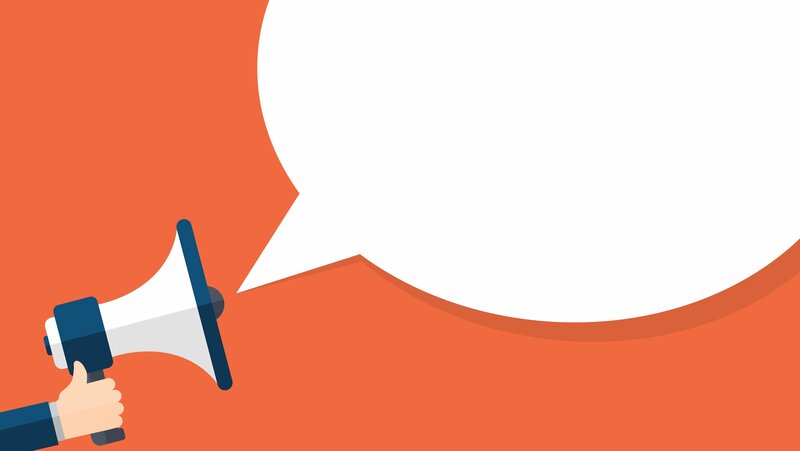 If you'd like to learn about personalizing your marketing -- including your landing pages, calls-to-action (CTAs), and emails -- be sure to download our new, free guide: How to Master Personalized Marketing.